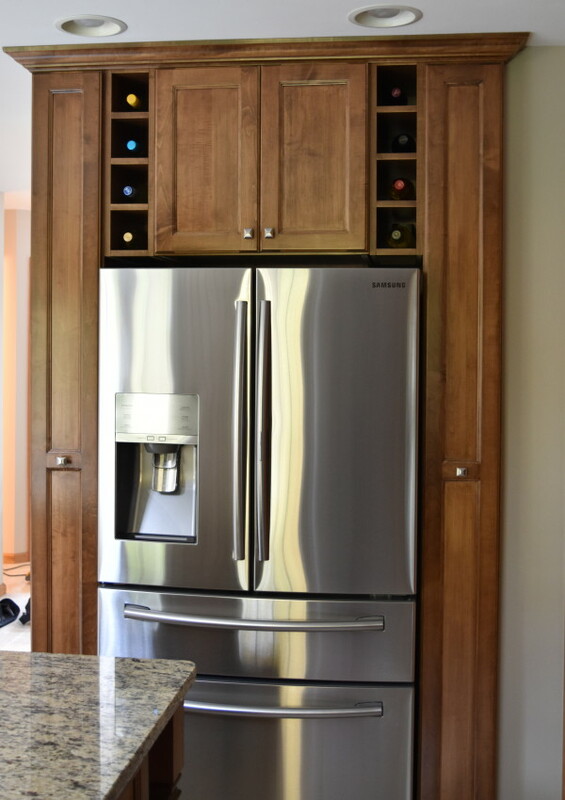 As of late, I am seeing that 90% of new kitchens have painted cabinetry – 85% of which are white – so when this client was adamant about wanting stained cabinets for their new kitchen, I happily obliged. 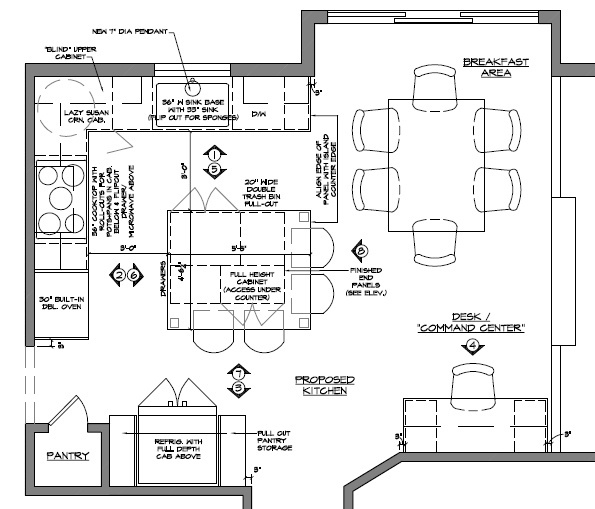 For this project, the client had a clear vision & many decisions were already made when we started working together. It made my job easier + my role less than typical compared to working with clients that need more ‘hand-holding’. 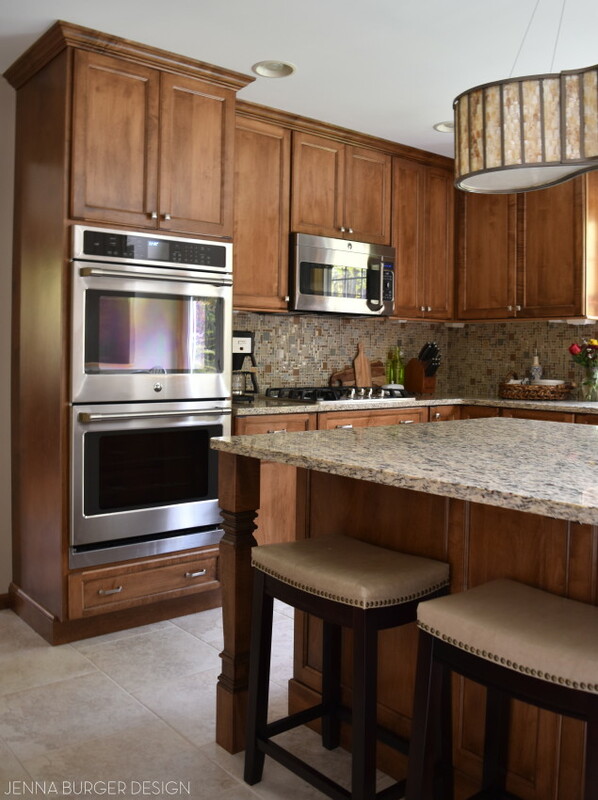 With my assistance, I was able to steer / direct them in making design choices that suited their style to achieve the kitchen they envisioned. Like I always say, you have to see the before to really appreciate the after. And the kitchen before really needed some TLC. 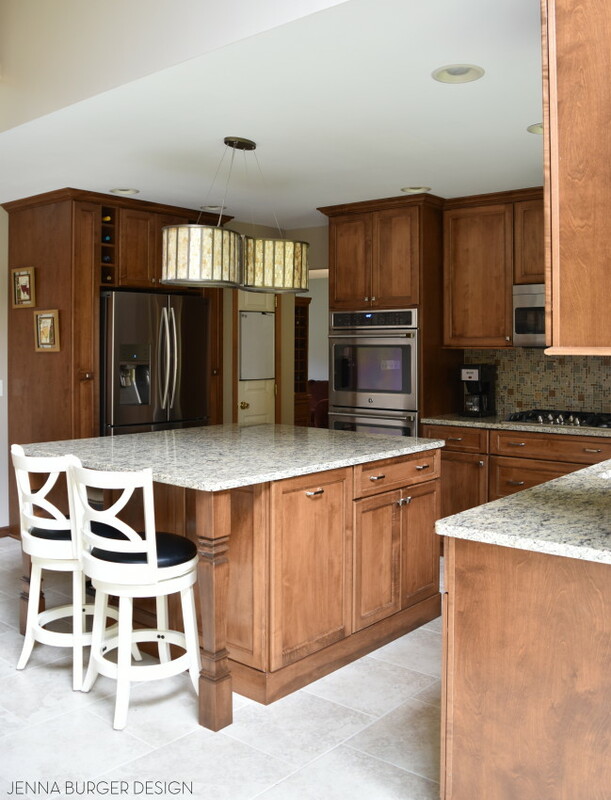 The construction of this kitchen was a bit unique and easier than most because the renovation took place before the clients moved in. 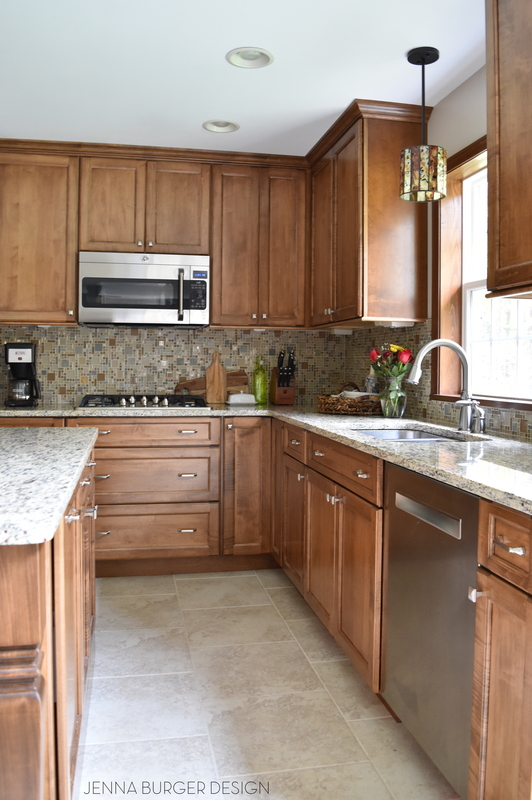 This home was a new purchase for them and during the time before the closing, the design process was started. Yes, a bit risky in case “the deal” fell through, but once they closed on the home, construction began the following day. 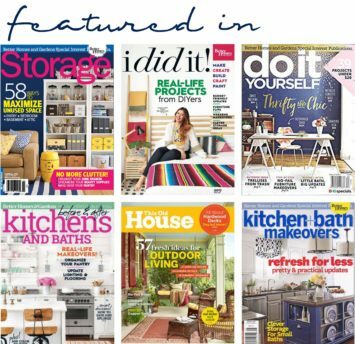 All the prep work + purchases were complete and we were ready to move forward. 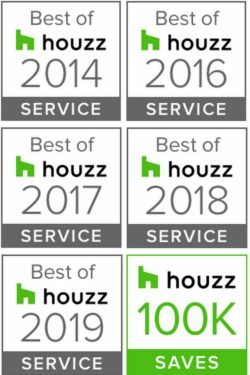 The client had about a month before they needed to move in, so everything was scheduled on a tight timeline. Aside from some hiccups with waiting for the countertops to be installed, demo + repair + installation of the new cabinets went fairly smoothly. 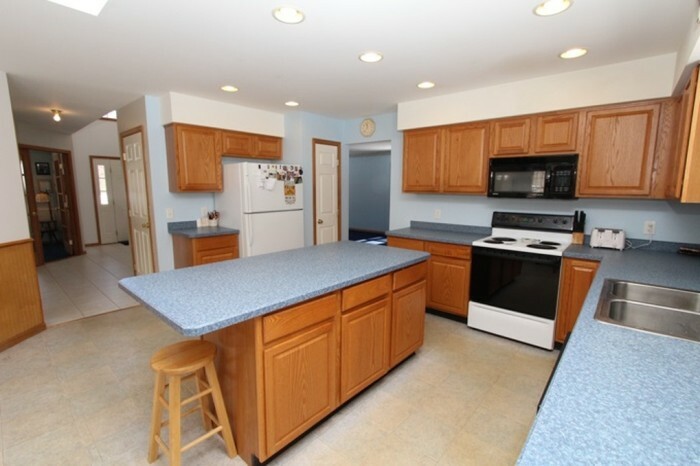 Aside from the old kitchen being worn + dated, the space was also not being utilized to it’s maximum potential. 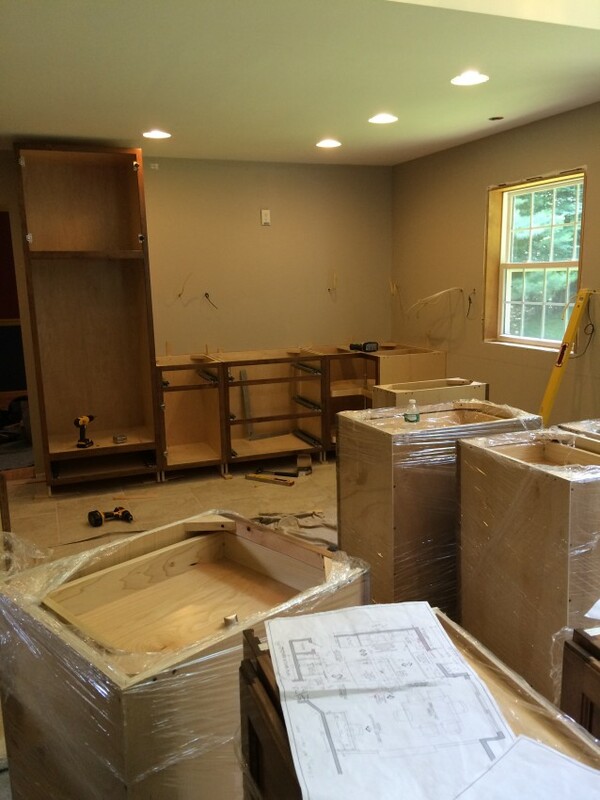 As the new plan evolved, there was no question that first to go was the soffit above the existing cabinets. 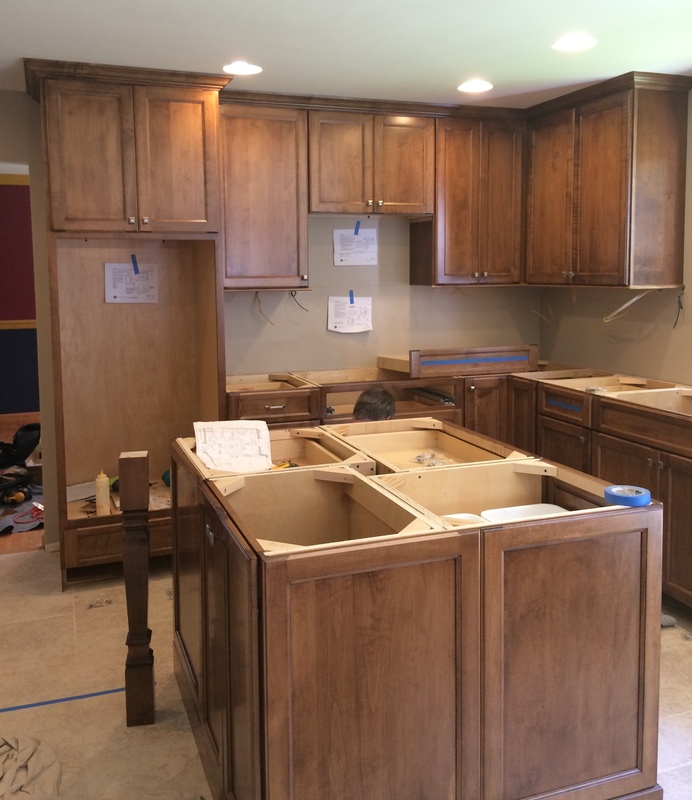 The new upper cabinets would be taller and continue to the ceiling, then be finished with a decorative crown moulding. 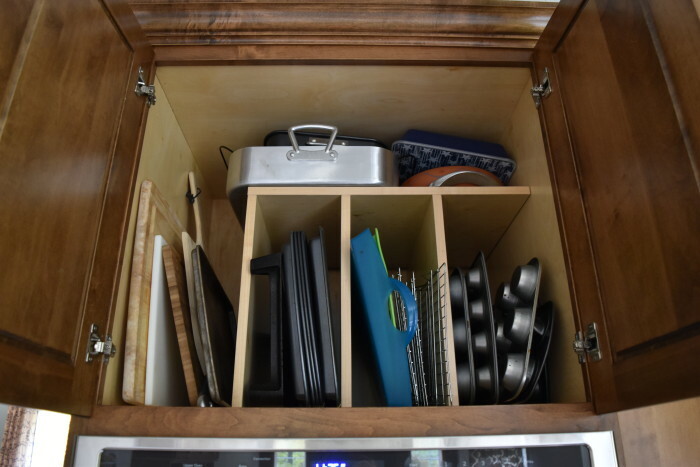 The next area of focus was the island – a larger, more substantial island with lots of storage + space to eat-at was a must. 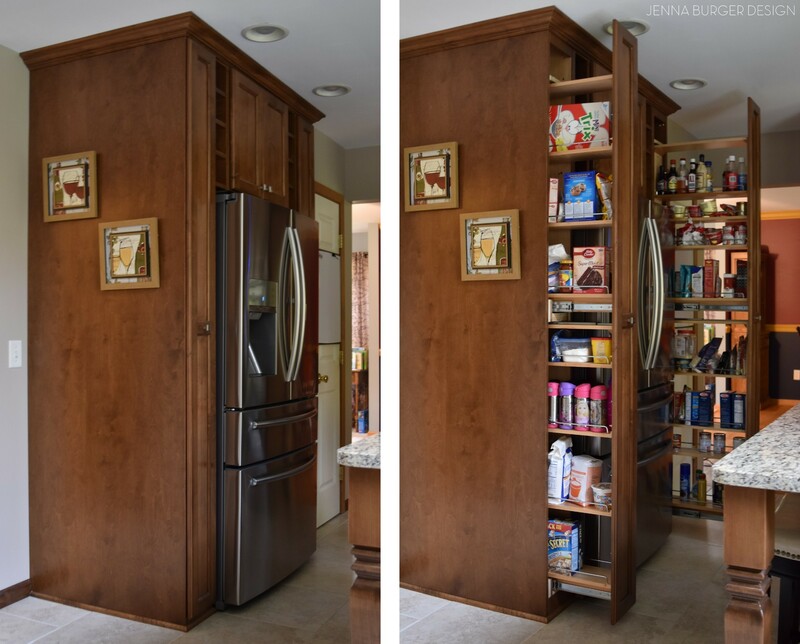 Following that, the refrigerator area needed updating to maximize storage. This is the view as you walk into the kitchen from the entry foyer and it’s gorgeous. Light shines in from the exterior and the space feels bright & fresh. 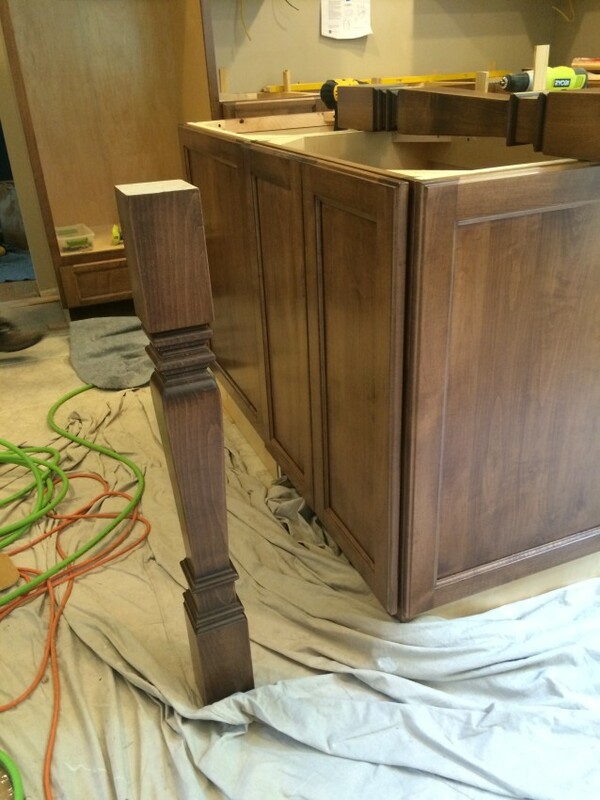 The cabinets are a mix of a few stains, which took a several tries to get just right. 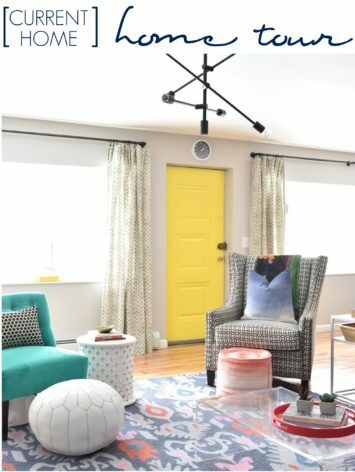 The hue we wanted to achieve was a light-medium brown with no orange or red undertones. In the end, the result is rich and warm. 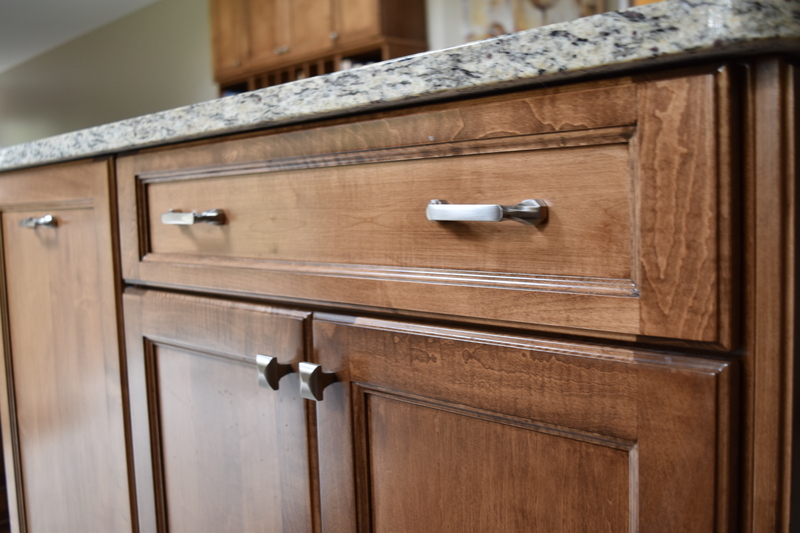 The cabinets are a full overlay door style (which means the door sits proud of the frame instead of being inset) with a recessed panel door. 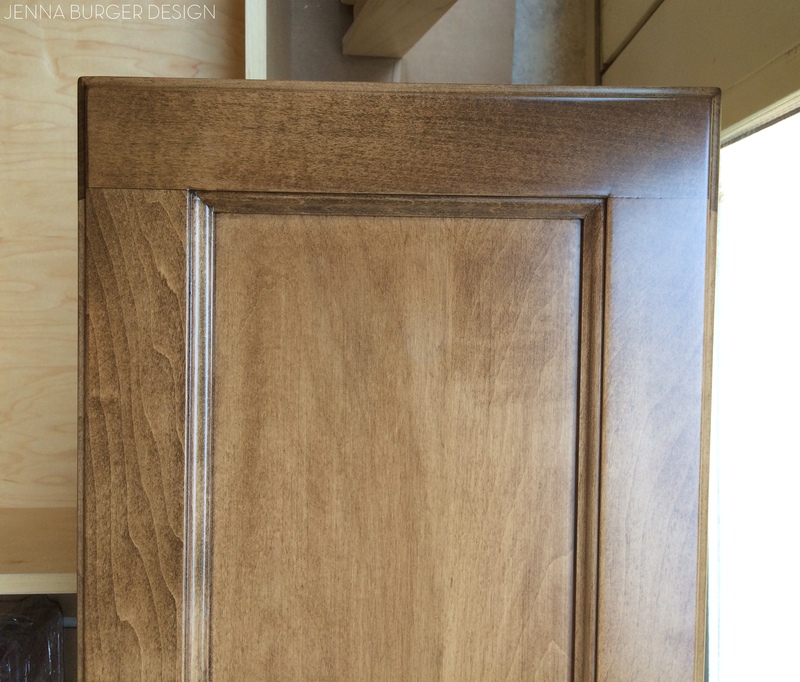 The door itself has a decorative edging on the outer perimeter + at the recessed panel. 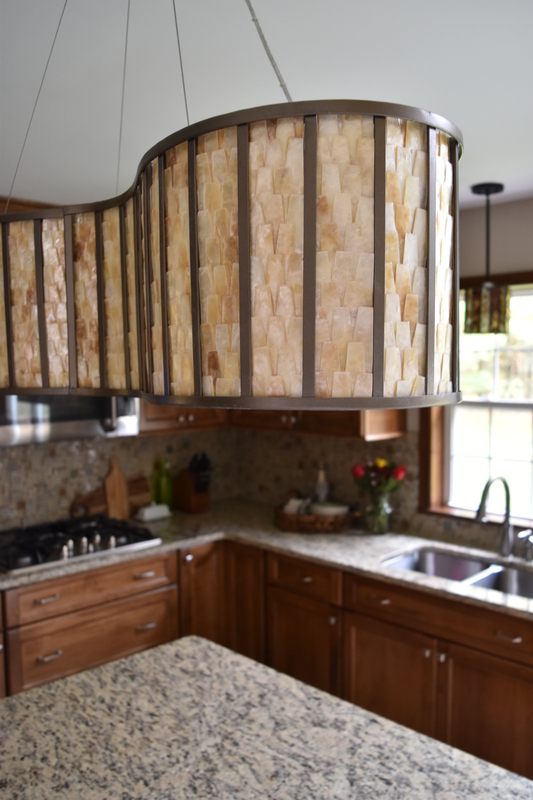 The lighting was chosen by the clients and even though I had suggested other fixtures, these look great. 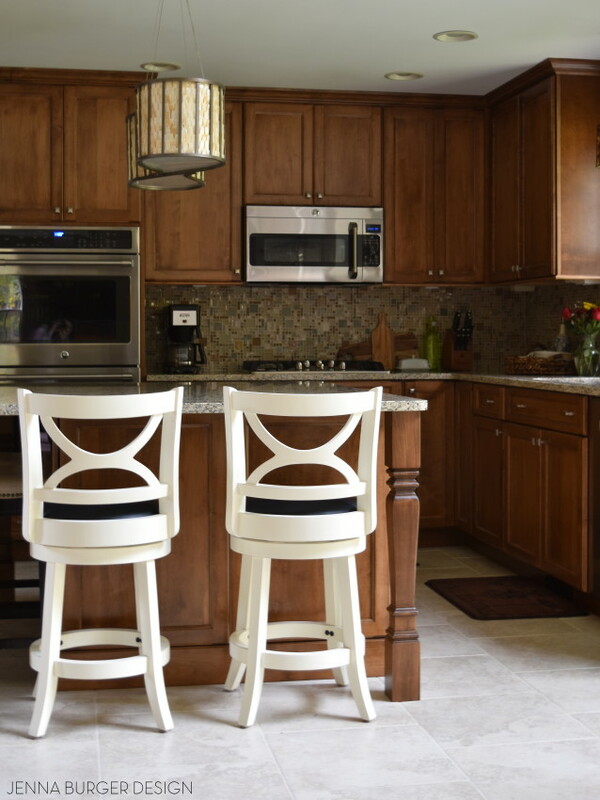 Cream colored counter stools beautifully compliment the stained cabinets. 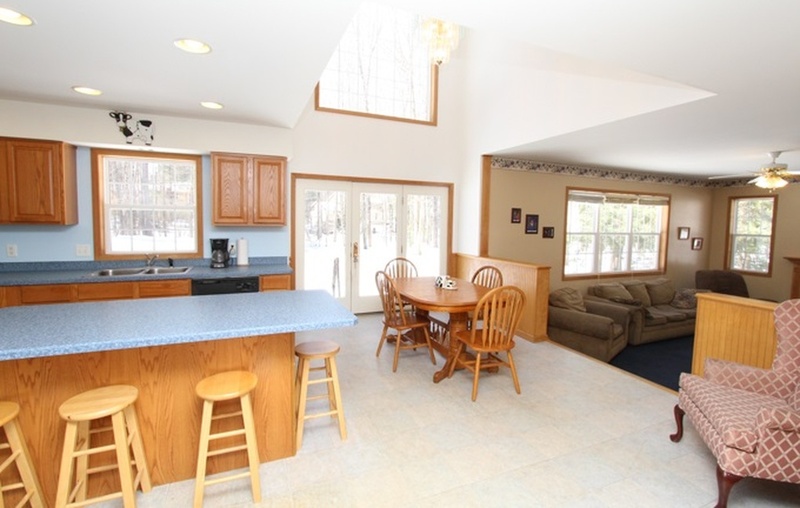 The home is a combination of hardwood, carpet, and tile. 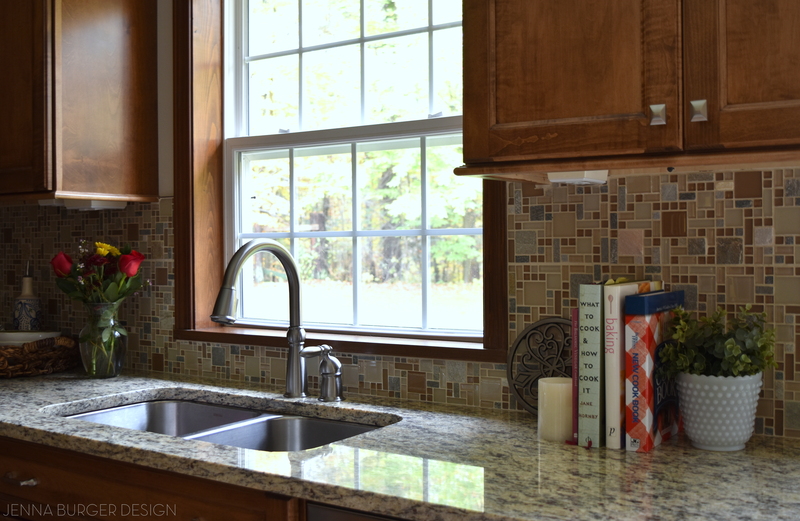 The tile for this kitchen continues from the foyer and it’s a 18 x 18 ceramic with a staggered layout. 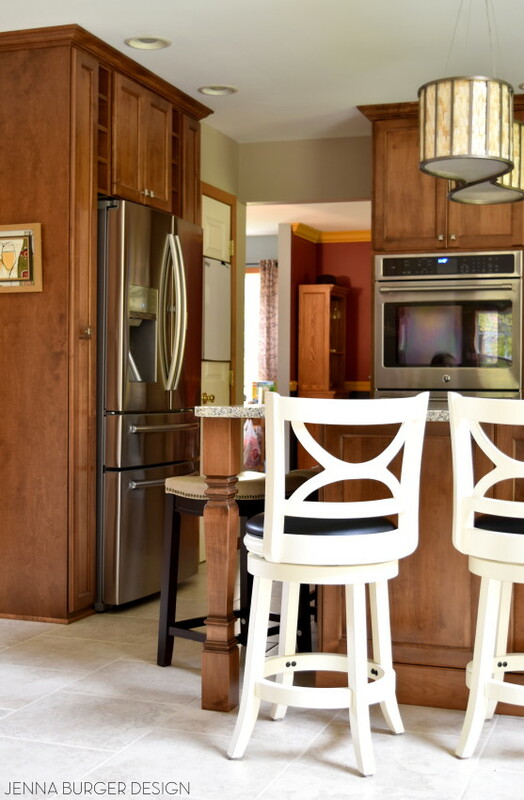 It’s lighter tone is the perfect backdrop to the darker cabinets. 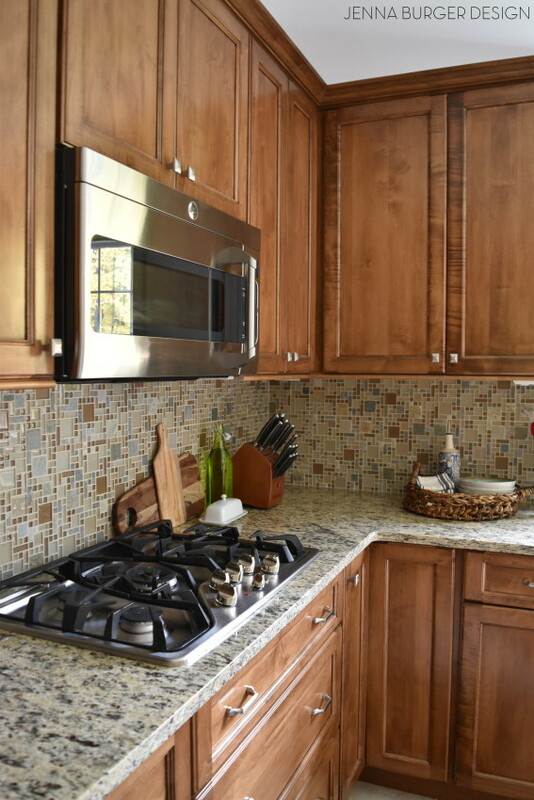 When it came time to choose the countertop and backsplash, it was important to select something that enhanced the beauty + tones of the stained cabinets. 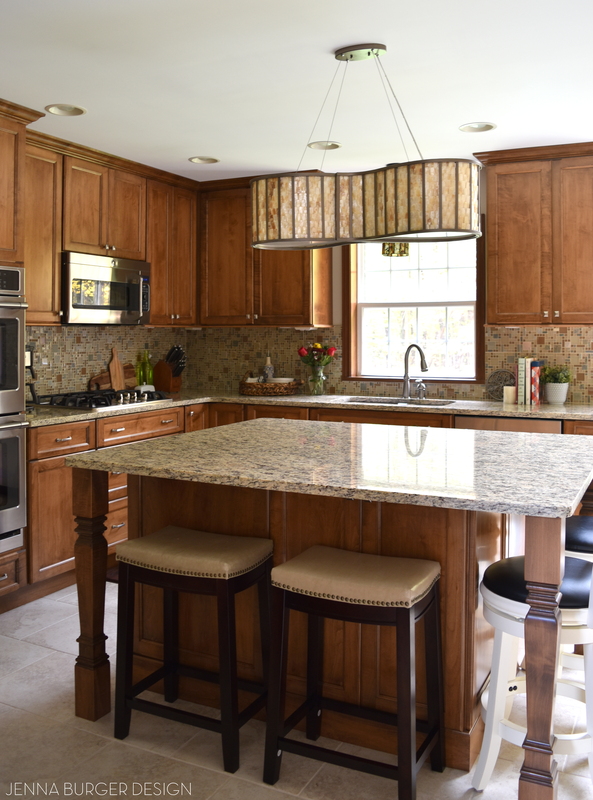 We decided on a granite that has flecks of caramel, black, and taupes – it’s so rich with lots of depth. For the backplash, a mosaic with varying-sized square glass pieces was what suited the clients style best. 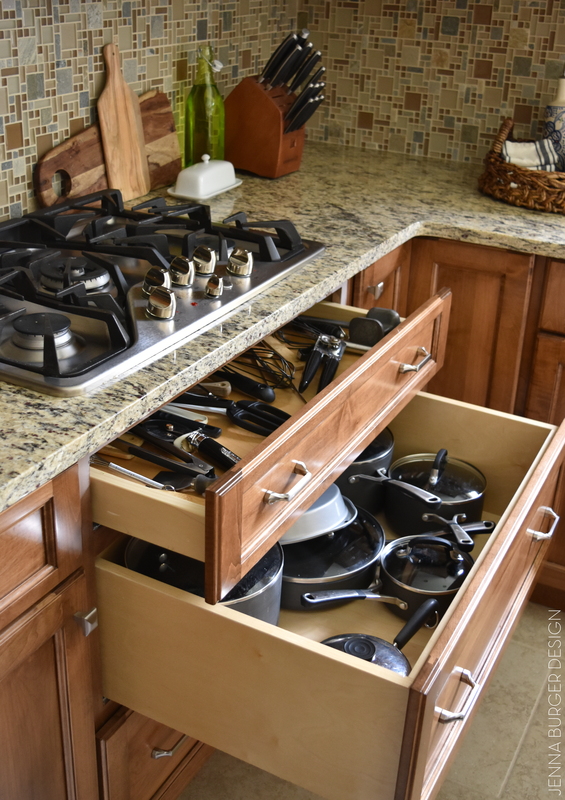 The cooktop is set into the counter and 3 roll-out drawers were added underneath which gives ample storage for pots, pans, and cooking utensils. 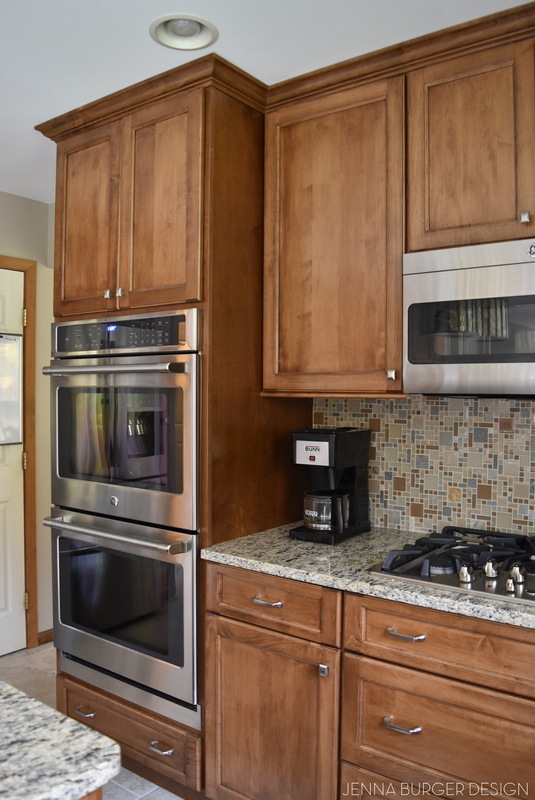 A double oven sits to the left of the cooktop. Above is full-depth vertical dividers for large trays and platters. Where the non-functioning refrigerator space was before, a new refrigerator + pull-out pantry storage was added. These slide-outs with adjustable shelves have been a wonderful update and the amount of storage is incredible! 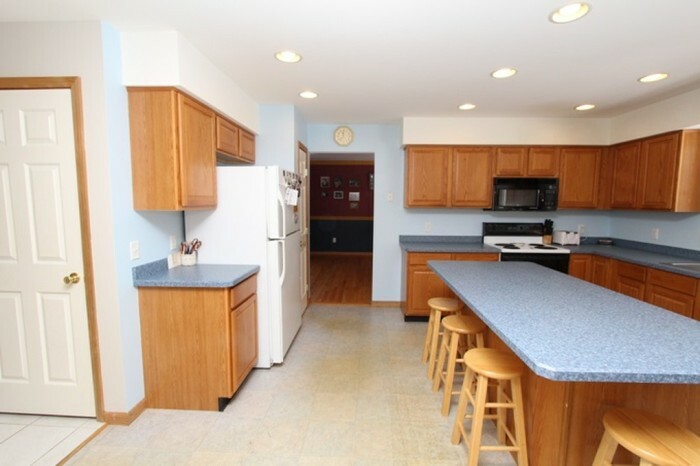 Taking a step back, this is another view of the overall newly revamped kitchen. 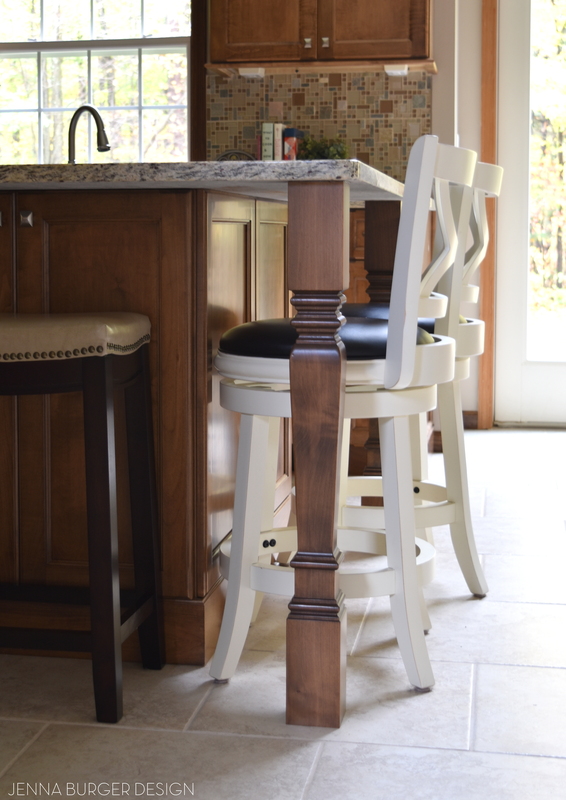 I am so smitten over the island legs! This new space doesn’t only stop at the kitchen cabinets, but a desk was also added. 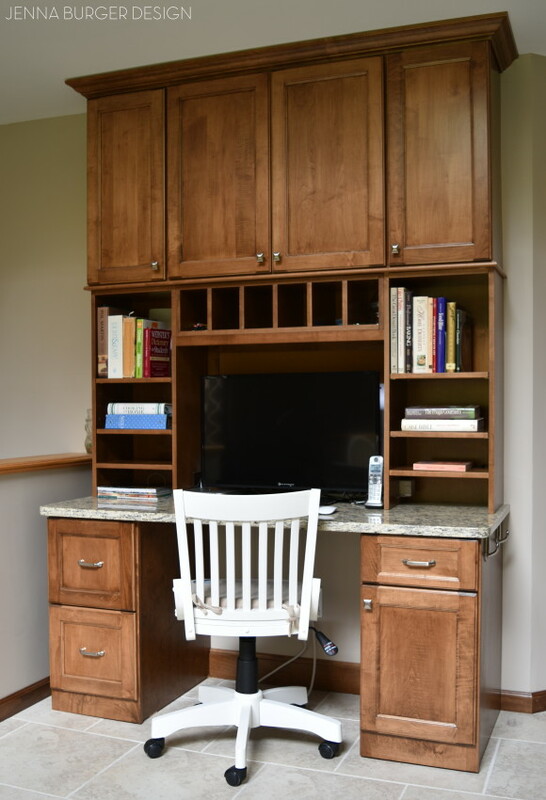 With a combination of open & closed cabinetry, this desk space is the command center for this family. 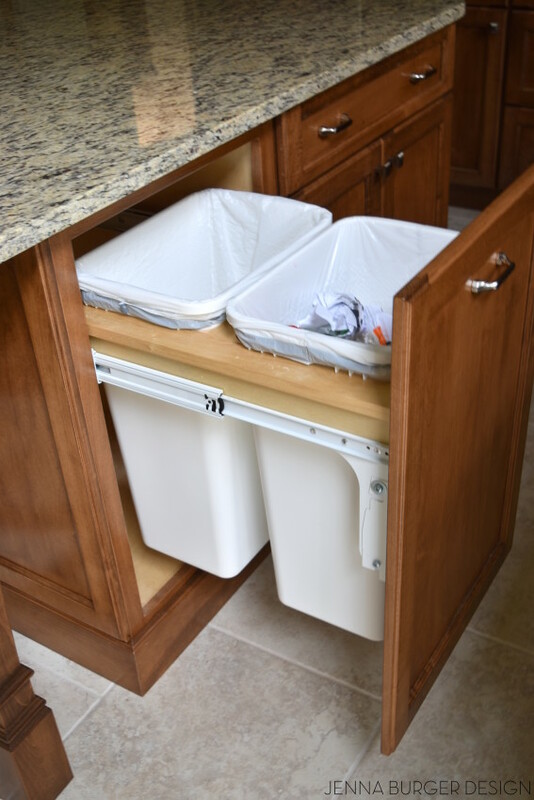 Another hidden gem + must-have in the kitchen, a trash bin pull-out! This is a double for trash + recycling and in the island was the perfect placement. And there you have it. 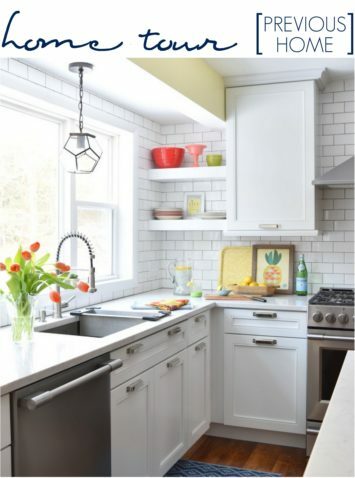 The before & after of this kitchen renovation is pretty incredible! It was such a wonderful job to be a part of. Another project complete! 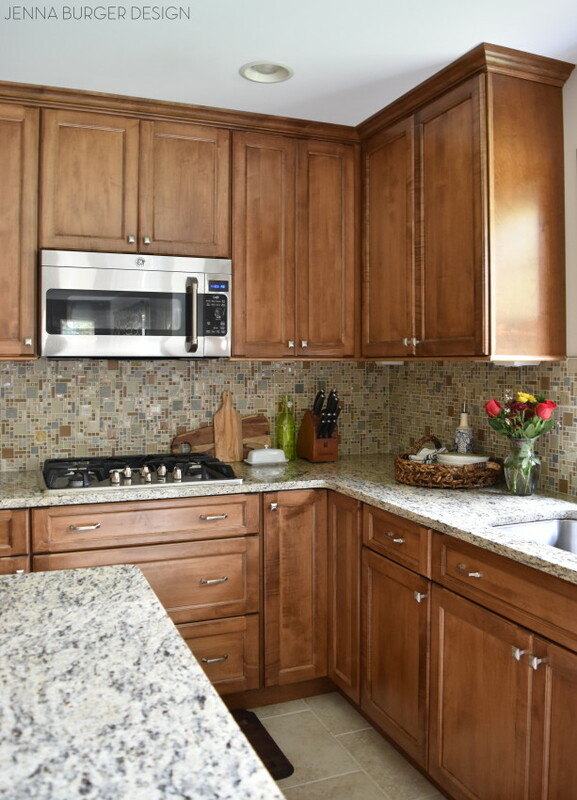 Do you like stained cabinets or do you prefer painted? Makes sense. Everyone likes something different! I get it. Thanks for sharing your thoughts and I hope you enjoyed this transformation. 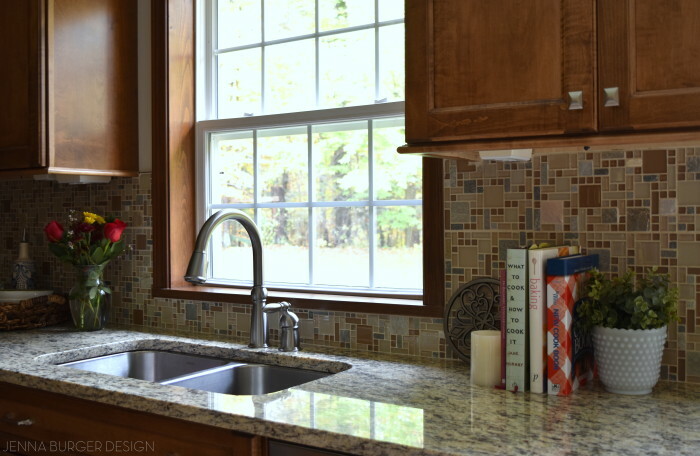 What is the pattern name and tile brand of the mosaic tile backsplash with glass tile squares? 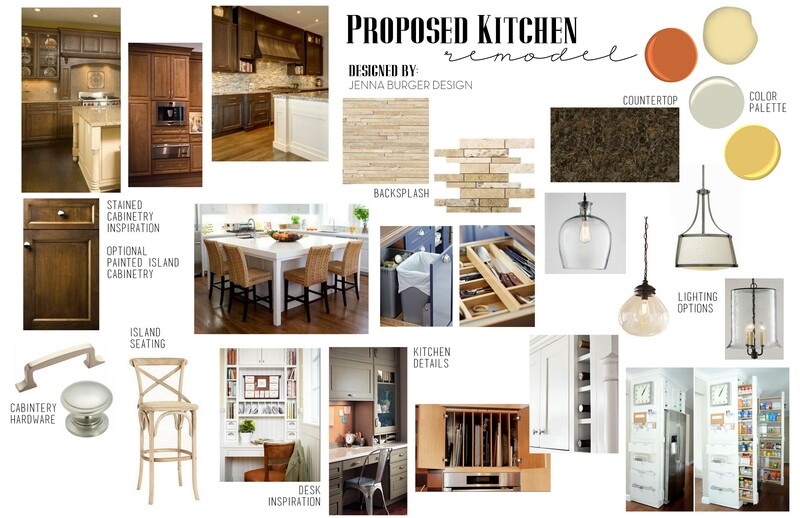 It is just what I have been looking for to coordinate with my speckled granite countertops to pick up all the colors…. Unfortunately I don’t. 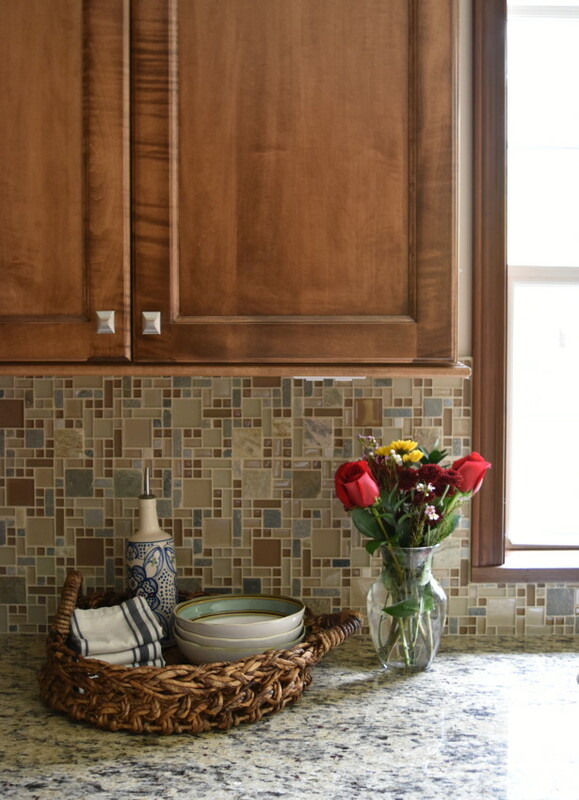 The tile was chosen by the client.